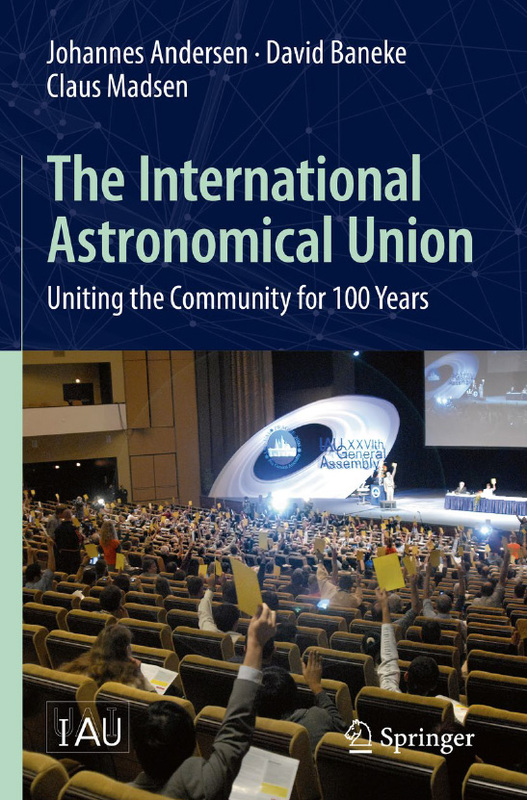 A new book entitled The International Astronomical Union — Uniting the Community for 100 Years has just been published by Springer. In this, the centenary year of the IAU's founding, the book chronicles the first 100 years of the IAU, its accomplishments, and its evolving place in society. A joint effort by authors from both within and outside the IAU, the book presents inside and outside perspectives of the Union against the backdrop of the historical, scientific, and technological developments of the past 100 years. While much important scientific progress took place before 1945, the book naturally focuses on the accelerating evolution during the second half of the 20th century. The IAU has itself evolved significantly in the past few decades, broadening its previously narrow focus to include societally relevant activities, such as addressing the hazard of asteroid impacts, the planetary status of Pluto in the solar system, and the hugely successful International Year of Astronomy 2009. Most recently, it has been spearheading a combination of science literacy and public outreach projects. The book will appeal to both professional astronomers and an astronomically interested general audience. The authors are former IAU General Secretary Johannes Andersen (Denmark), science historian David Baneke (Netherlands), and Claus Madsen (Denmark) a former outreach and policy officer at the European Southern Observatory. See the attached flyer (PDF) for information on a special discount offer valid 11 April to 9 May 2019.